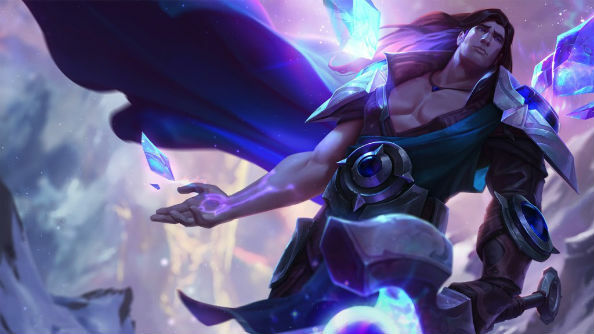 Riot’s mission to re-energise the original cast of 40 launch Champions in League of Legends continues with the latest patient: Taric. Within the community there is a highly vocal consensus as to which Champions desperately require work. Yorick, Urgot, Singed and Evelyn are all crying out for the surgeon’s knife, but none were as critically ill as poor old Taric. His kit was uninspiring, his pick rate unbelievably low, and his visual styling as out of place as it was ridiculous. If he had disappeared from the League landscape entirely, only a handful of players would have missed him, if they noticed he was gone at all. Just getting started? The best League of Legends champions for beginners are what you need. This operation was always going to be transformative rather reconstructive, and Riot has delivered just that. 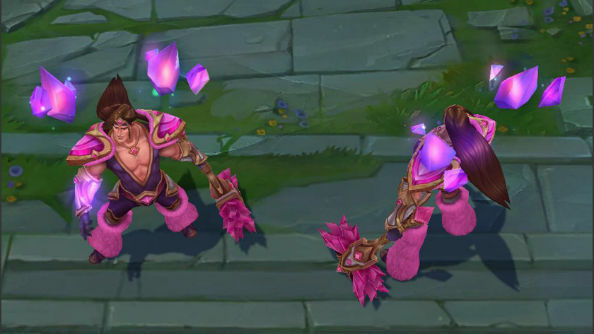 He’s made his bedazzling entrance, and only one of Taric’s abilities remains relatively unscathed – thank God. Much like Poppy and Sion before her, this rework is full-tilt and all the better for it. Taric has retained his identity as a healing support, but now he also brings a bag packed with utility to the party, making him a real threat and finally, a viable pick. Melee supports should be perfectly au-fait with up-close and personal fights, and this passive allows Taric to hold his own when toe-to-toe. If firing three abilities in quick succession, the burst gained should allow him to dent the health of an enemy squishy, making them easier pickings for his carry. Bravado also has a great synergy with items with on-hit effects like Rylai’s Crystal Scepter. Taric heals himself and all nearby allies based on the number of Starlight’s Touch charges he’s stored. Taric generates up to three charges over time. At it’s core, Starlight’s Touch is a straight-up heal in the same vein as Imbue, which it has replaced. 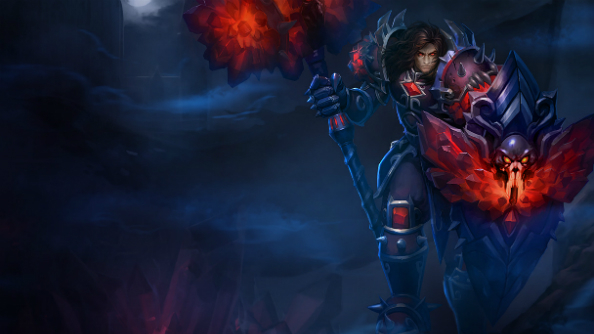 The minor changes are welcome, however, as Taric no longer has to choose between healing himself or healing an ally. Obviously this gives Taric and his carry huge amounts of in-lane sustain, allowing them to keep on fighting as their opponents are forced to recall. 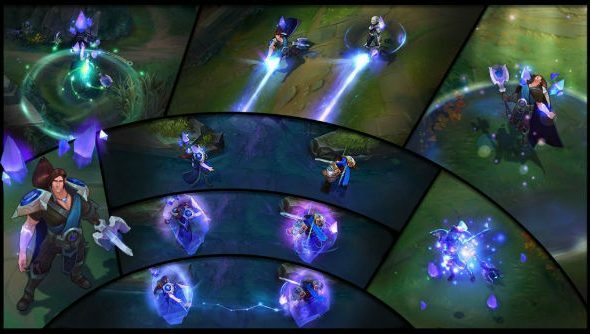 This ability is the most defining change to Taric’s non-ultimate toolkit, and will undoubtedly make for exciting plays. The shield is useful for the usual reasons – sustain, diving towers, blocking carry damage and so forth, but it’s the ability-mimicking link that really deserves attention. Bastion effectively doubles Taric’s ability to heal, and stun. Much like Kalista, who also tethers herself to a target ally, effective communication between Taric and his lane partner will be key to making the most out of his ability output. In its previous form, Dazzle was click-hit projectile which only affected one enemy – useful, but boring as hell. Dazzle is now a skillshot which can miss, but it can also stun multiple foes, potentially disrupting the enemy carry and support at the same time. Even better, if Taric is near his linked ally, Dazzle is also cast from their position. Clever positioning could allow this ability to temporarily take out the majority of an opposing team in a close proximity brawl. The reaction to Cosmic Radiance has been mixed to say the least. Detractors have complained that Riot is becoming overly reliant on ultimates which apply AoE invulnerability in some form. Bard and Kindred both shipped with larger scale equivalents of Zhonya’s Hourglass and Tryndamere’s ultimate, and now Taric has the ability to apply a Kayle-like R onto multiple members of his team. Popular or not, this ability is a game changer. Several seconds of complete invulnerability is a lifetime during teamfights or tower dives, especially during the late game. As if it wasn’t powerful enough on its own, Cosmic Radiance is also mimicked by Bastion if Taric is near his linked ally. It’s also worth noting this ability’s current timings on PBE. Cosmic Radiance channels for 2.5 seconds and is active for the same amount of time. That’s a long time to wait for the effect to kick in, meaning that Cosmic Radiance is best deployed in situations where Taric well aware of an incoming threat or during a carefully planned assault. Pressing R during a Katarina ultimate is unlikely to shelter anyone from harm, as the invulnerability will deploy after the damage has been done. Having spent some time with Taric I can confirm that the bastion of boredom (get it?) is finally fun to play. He reminds me a lot of Braum, not because their individual mechanics are similar, but because they’re both great at enhancing your lane partner’s ability to make daring plays. That said, Taric’s early game is still pretty tricky, especially against a pair of poke-queens like Caitlyn and Lux. Dazzle’s range isn’t spectacular, and because he’s a melee champion, landing his passive double-hit can be nearly impossible unless he accepts a certain amount of aggression in return. Of course, that’s what Starlight’s Touch is there for. Speaking of healing, with Sona, Soraka, and Alistar all sporting healing abilities of their own, Taric could easily have treaded on their toes, but the AoE nature of his heal, along with Bastion, makes him particularly adept at two or three player dives, whereas Sona or Soraka are only able to heal one or two players at a time. Out of curiosity I tested Taric’s ability to accommodate a damage-based build, but the results were middling. The only real way to increase his damage output is to slap some AD items on him along with Dead Man’s Plate and a Sunfire Cape. With these equipped he deals moderate damage, but after the stun on his E has ended, he as no way of sticking to targets and they generally scurry away before he can inflict a killing blow. Don’t expect him to pop up outside of bot lane any time soon. I’ll be frank, I hated old Taric’s design. The oversized boots, the ridiculous hammer, the voice, it was a hot mess. Taric 2.0 is a vast improvement. His new, slightly effeminate aesthetic exudes the same long-haired narcissism of a Disney prince. Listen to his dialogue and you’ll also hear notes of Johnny Bravo as he brags about ‘men with big gems’. The dance is my favourite part, Taric vogues like bot-lane Madonna. The complete effect is cheeky rather than ridiculous and far more in keeping with what we now expect of the League universe. He’s kind but vein, guilty but self assured, a compelling combination. There’s also a whole new lore to enjoy. Taric has been reimagined as a Demacian exile who is forced out of the military after the abandonment of his post leads to dire consequences. He now wanders Runeterra, eventually finding himself on Mount Targon, seeking redemption for his neglect by combatting the forces of the void. As they did for Ekko, Riot has produced a digital comic, titled ‘The Ascent’, that introduces his Taric’s new persona. It’s a pleasant read, though its presentation of his character omits the more self-obsessed, vain elements, which for me are the primary reason he’s now of interest. Taric’s effectiveness is highly dependent on Bastion – as much as possible, remain in proximity to a linked ally. If you switch lanes or roam, be sure to cast at the earliest moment possible. If a friendly jungler enters your lane, it may be worth transferring your link from your carry to them instead as they choose to engage. It’s a universal truth in League that positioning is key, but with Taric on your team this is especially true. When Dazzle is cast from your linked ally, it fires toward you cursor, not in the same direction that Taric is casting. This means that if Taric’s ally wants to land the stun, they should place themselves on the other side of the enemy, so that the opposing team member is in between Taric and his ally. Cosmic Radiance is better for planned engagements because of its long channel time. If planning to ambush the enemy from the brush with your carry, press R a second before diving in, this way the invulnerability will take effect just as the opposition attempts to respond. A word of warning however: beware mobile threats. If the enemy manages to avoid your attacks and return quickly, you will be far more vulnerable. Think twice before deploying this tactic on champions with solid escapes (I’m looking at you Ahri). Healing is great, we all love a good heal, but Taric can quickly run out of mana if he’s overzealous with Starlight’s touch. As he’s a melee champion and his passive relies on the casting of abilities, this renders him utterly useless. Be thrifty. Taric is only equipped with one damage dealing ability, Dazzle, which scales with AP, making ability-based items relatively cost-ineffective. Instead of focusing on damage, it’s more advisable to play to his strengths by increasing his durability, sustain, and lowering his cooldowns. Do buy Frozen Heart – On Taric, this item is perfection. 20% cooldown reduction allows him to spam his Q and E with greater frequency, and more regularly begin dramatic engagements with Cosmic Radiance. The 90 bonus armor and 400 mana make him hardier, and ensure that the bonus cooldown reduction won’t see him mana-less in two minutes. Don’t buy Warmog’s Armor – A tempting buy for the utterly ludicrous amount of health regeneration it provides, but ultimately, this doubles up with Taric’s Q. The man can heal himself, don’t go wasting your hard-earned gold on functionality you already have. Do buy Iceborn Gauntlet – The perfect compromise between the aggressive and the defensive. The 65 bonus armor adds AD protection on top of Bastion’s passive, and the addition of 500 mana will allow regular casting of Starlight’s Touch. For when Taric goes on the attack, Spellblade will add moderate damage to his basic attacks if he appropriately spaces out the casting of his abilties (1.5 seconds gap or more) to ensure it reactivates every time. Don’t buy Rabadon’s Deathcap – It seems like a no-brainer, but some will assume that a support with AP scaling abilities becomes deadlier with an ability point boost. Usually that would be the case, but Taric only has one ability that deals AP damage, making purchases like this totally pointless. Do buy Spirit Visage – Taric ships with built-in armor, but AD champions aren’t the only threats out there. Spirit Visage provides ample protection from mages with 70 bonus magic resist and 500 additional health. It also synergises perfectly with his Q by increasing his self-healing by 20%, quite possibly the difference between life and death. 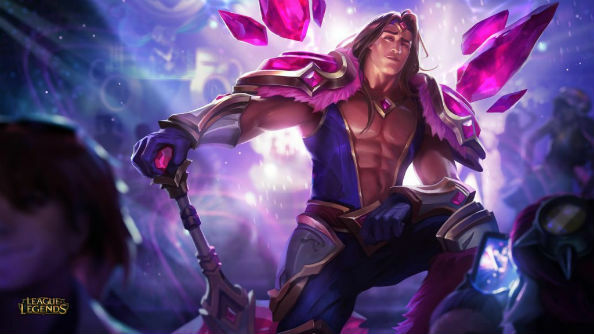 Taric is nearly unrecognisable from his former state, but that’s a good thing – his design finally shines like a polished gem. Initial worries that he might trespass on the territory of other healers were unwarranted. Instead, it’s Cosmic Radiance that feels dangerously familiar. Riot’s current penchant for invulnerability ultimates leaves Taric in the same vaguely familiar space as Kindred and Bard. Yes, his R is extremely useful; yes, its applications are different to those of the aforementioned champions; but to bronze-level players it undoubtedly feels like well-trodden ground. With Worlds 2016 looming on the horizon we’ll see how Taric slots within the meta over the coming months. I suspect that we’re in for some spectacular teamfights and a terrifyingly effective Kalista-Taric bot lane duo. Time will tell. Have any tips for playing him yourself, or tactics for defeating him should he pop up on the opposing team? Let us know in the comments below.